Notes: Exomvourgo or Exobourgo (Greek: Εξώμβουργο/Εξώμπουργκο) is a mountain on the island of Tinos. It has a rugged appearance, unlike the other mountains in the Cyclades and is the site of a ruined Venetian fortress and town. 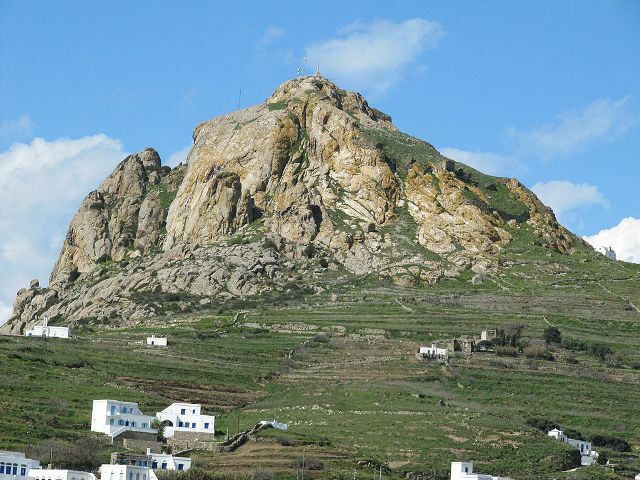 Exomvourgo is not the highest mountain on the island—that is Tsiknias—but is in a central location ringed by a large number of small villages such as Tripotamos and Falatados and can be climbed from several of these. The walk up from Iera Kardia Iisou takes around 20 minutes. The former Exomvourgos municipality shares its name with the mountain.